The 8th of March is International Women’s Day, recognized by the United Nations in 1975. This celebration was established as an opportunity to reaffirm the extent to which women have broadened their potential by playing larger roles in peace, security, and development, and enhancing their standing in organizations and communities, while at the same time discussing further progress for the future. The day is also intended as an occasion for us to renew our determination to achieve further progress for the future. The United Nations and countries around the world hold various events on International Women’s Day to celebrate it. 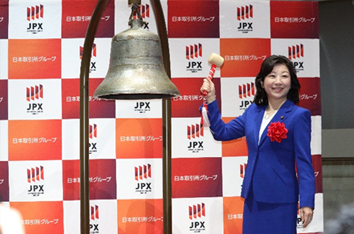 In Japan too, against a background of the current growing trends for ESG (Environmental, Social and Governance) investing and women’s empowerment in the stock market, the Tokyo Stock Exchange held its first “Ring the Bell for Gender Equality” event this year. I was among those who attended the ceremony and rang the bell with the hope that women with enormous potential would demonstrate their capabilities to the full and contribute to the economic growth of not only Japan but also the entire world. Japan is going to face the crisis of a continuing decline in its child population, and accelerated overall depopulation from now on. Overcoming this crisis requires us to create an environment where women in Japan, as the country’s richest source of potential, can demonstrate their individuality and capabilities in accordance with their aspirations, leading to the greater diversity and vigor of our society and economy. 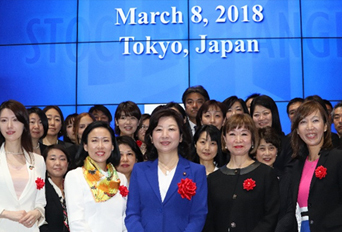 For this purpose, the Japanese government has so far implemented various measures, including formulating the Fourth Basic Plan for Gender Equality, designing the Intensive Policy to Accelerate the Empowerment of Women for each year, and enforcing the Act on Promotion of Women’s Participation and Advancement in the Workplace. These efforts have been rewarded with reliable achievements, such as an increase in the number of female workers by about two million during the past five years, and in the rate of working mothers. Going forward, the Japanese government as a whole must pursue women’s empowerment and labor reforms in an integrated way, aiming for a society with diversity as its strength brought about by a breakthrough in women’s empowerment. It is extremely important to recognize women’s empowerment as an economic policy leading to greater productivity and stronger economic growth, rather than merely as a measure to supplement the labor force. Although we still have a long way to go, we will devote all our energies to building a society where all women can demonstrate their individuality and capabilities in accordance with their aspirations, which will result in a sustainable society in which all people can work and live in comfort.